Colombia tours offer a wide variety of travel adventures and terrain to experience with its tropical beaches on the Pacific and the Caribbean coastlines, snow covered peaks in the Andes, humid rainforests in the Amazon, dry savannahs in “Los Llanos”, and lush valleys that produce some of the best coffee in the world. In recent years Colombia has made a drastic turn around, once a place deemed too unsafe to travel for tourists the beautiful country’s tourism industry is flourishing. Colombia is ideal for those looking to explore historic cities, visit pristine tropical beaches, or simply relax in beautiful colonial villages full of Spanish architecture and history. 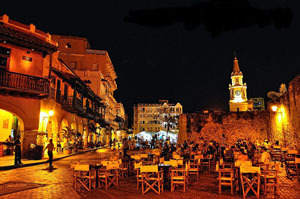 The historic city of Cartagena has long been a favorite vacation spot for many. The city offers unique festivals, colonial architecture, delicious restaurants, and beautiful hotels. Global Basecamps offers a wide range of Colombia itineraries filled with visits to untouched islands, historic cities listed as UNESCO world heritage sites, local indigenous communities, night clubs, amazing National Parks, and isolated beaches perfect for relaxing. Some of the trip highlights include a Cartagena City tour, Tayrona National Park, Pink Flamingo Sanctuary, and the breath taking beaches of San Andres and Providencia Island. Tayrona National Park is one of the most beautiful areas of South America. It is approximately 58 square miles and is one of the most biologically diverse coastal zones in the Americas. The popular Tayrona Park lies at the Caribbean coast near Santa Marta in Colombia and is about 30 minutes from the city center. The journey begins at Tayrona Beach, where the Caribbean ocean meets the deep forest. A bush walk adventure takes you to the amazing beaches of Tayrona National Park. Animals found in the park include monkeys, red squirrels, collared peccaries, jaguars and hundreds of species of birds. The park has two rainy seasons, one from May to June and the other from September to November. The park includes some of South America’s most beautiful coastline. If you’re looking for a relaxing Colombia eco adventure, Tayrona National Park is ideal with it's beautiful beaches, hammocks to rent for the night, food, water and surf. Get your cameras ready to take awesome shots of majestic South American flamingos! 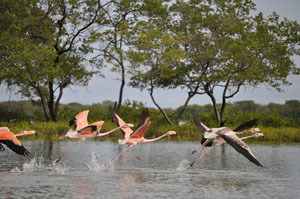 The Flamingos Flora and Fauna Sanctuary is located on the desert coastlines of La Guajira, an area populated by the Wayuu Indian population. The flamingo sanctuary visit is followed by a visit to a local Indian community to learn of their efforts to preserve their natural environment and indigenous culture. A short flight takes you to the incredible island of San Andres. The Colombian Caribbean Island is filled with fantastic beaches. Providencia, another island a short flight away, is one of the few remaining Caribbean islands that have not yet seen mass tourism. On the small, tranquil island you can enjoy water sports and bush walking. 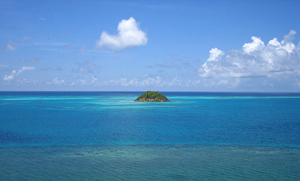 With a large barrier reef, Providencia has incredible scuba diving and snorkeling! Our Colombian partner is locally owned and operated, promoting sustainable travel and ensuring travelers have a more authentic experience when exploring the stunning country. Further, all the treks and excursion to remote locations help support local economies and sustainable projects. All our accommodations offer a wide range of unique lodging options and each itinerary can be customized to meet your specific needs. Start planning your Colombia trip today.